PEMBROKE, N.C. – Behind an offensive explosion, the No. 8 University of North Georgia baseball team ran past UNC Pembroke in both halves of a doubleheader Saturday. Both teams hit two more homers in the final innings of the game with UNG’s coming on a solo bomb by Conner Corbitt in the eighth before a two-run homer by Clarno in the ninth. After a Brave homer in the bottom of the fourth, Brady Eeles hit a solo bomb to right field to put North Georgia back up by four. The Nighthawks pushed two more runs across in the seventh inning on a Clarno RBI single and a fielder’s choice to get the game to its final score. Clarno went 5-for-10 on the day with seven RBI and three runs scored. Chase Sudduth went 6-for-9 with three runs scored. North Georgia had 29 hits on the day. The series finale is set for today (April 14) at 9:30 a.m.
DAHLONEGA, Ga. — From a quick double in the bottom of the first to a homerun in the sixth inning, Crews Taylor led the No. 8 University of North Georgia baseball team on a comfortable track to close out Auburn Montgomery with a final score of 9-2. Wednesday night’s matchup was all UNG as the Warhawks went scoreless for four innings until finally securing their place on the board in the fifth inning. AUM had several close windows to cut the lead, leaving players on third base in back-to-back innings. After two Warhawk runs in the fifth inning, the Nighthawks responded with two runs of their own in order to stretch the lead to 7-2. North Georgia continued to push the pressure late in the game. AUM managed to load the bases in the top of the ninth in a last attempt to cut the lead, but came up short. UNG incorporated seven different pitchers into Wednesday’s game with Kyle Luigs (2-0) earning the win with two innings of work. Taylor finished the day a triple short of the cycle, going 3-for-5 at the plate. Bill LeRoy also went 3-for-5 with three singles. North Georgia will hit the road this weekend, starting with a Friday showdown against UNC Pembroke at 6 p.m.
DAHLONEGA, Ga. — The Dahlonega-Lumpkin County Chamber of Commerce and the University of North Georgia did a great job hosting the 2017 Eggs & Issues Legislative Breakfast Friday at UNG’s Continuing Education Center. State Sen. Steve Gooch (R-Dahlonega) and State Rep. Kevin Tanner (R-Dawsonville) addressed a large, engaged breakfast crowd for about 30 minutes each, then answered questions, primarily related to the upcoming General Assembly that begins next week. Tanner also said there is lingering concern about school systems that are failing. Drugs, both legal and illegal, continue to be a serious problem legislators will try to deal with. “There are new opioid-based drugs coming on line every day,” Tanner said. China has produced a new drug being sold here in Georgia that is not illegal yet, but has produced two fatal overdoses in the last couple of months. “The opioid issue is something we’re going to deal with on Day 1,” Tanner said. Gooch pointed out that Georgia has been ranked the No. 1 state in the country to do business by the Site Selection Magazine four years in a row, due primarily to the state’s favorable tax structure. He also said the state, and in particular north Georgia, is reaping the benefits of having passed the Transportation Funding Act of 2015. The Georgia Department of Transportation has awarded hundreds of projects designed to improve the state’s infrastructure. 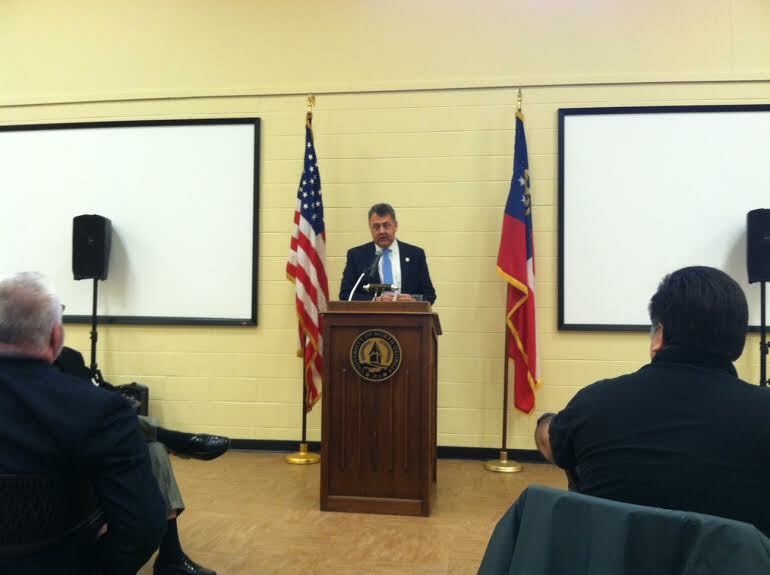 “You’re about to see $600 million spent on Ga. 400 all the way to where it intersects with I-285,” he said. “There will be a northbound and southbound lane added to Ga. 400 from McFarland to Browns Bridge Road. That work should be completed this year. Part of the northbound lane has already been completed and it has made a big difference in the commute time. Gooch spent much of the summer, traversing the state as co-chairman of a joint legislative broadband committee, studying how to bring internet access to rural parts of the state. Gooch said more than a dozen committees had studied the problem this summer and had come up with a report that incorporates 26 recommendations. That report is ready and is now posted on the state’s website. The problem, he said, is that companies will only invest hundreds of millions of dollars where they can expect a reasonable return on their investment and that is in the urban and suburban areas. YOUNG HARRIS, Ga. – No. 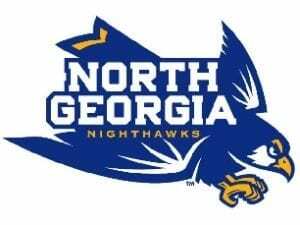 9 University of North Georgia split a Peach Belt doubleheader with Young Harris Saturday to clinch the conference series. In Game 1, the Mountain Lions scored first in the bottom of the first on a Zavier Lushington solo homer to put YHC up, 1-0. Young Harris continued to put runs up, scoring three in the fourth on two RBI singles. YHC scored two unearned runs in the sixth before plating their final three runs in the seventh to earn the 9-0 win. North Georgia had multiple chances to put up runs in the game, leaving 14 runners on base in the game. The UNG bats came alive in Game 2 as the Nighthawks soared to an 11-2 win. The fireworks started with a three-run blast from Conner Corbitt in the second inning. YHC answered with a run in the bottom of the frame on a RBI groundout to cut the lead to two. After a RBI groundout for UNG pushed the lead back to three, Young Harris used a solo shot to cut the lead to two again through four innings. In the seventh, North Georgia got two homers, first a two-run bomb from Crews Taylor before a solo shot by Chase Sudduth in the next at-bat. Sudduth brought home another run in the ninth on a RBI double before a RBI groundout brought home the 11th run. Sudduth was 4-for-6 at the plate in the doubleheader. North Georgia had 16 hits in the second game of the day, their second most in league play this season. The Nighthawks will take on Auburn Montgomery on Wednesday with first pitch set for 5 p.m.
YOUNG HARRIS, Ga. – Steven Bower tossed 8.2 innings of one-run baseball as the No. 9 University of North Georgia baseball team took the first game of the series against Young Harris Friday night by a score of 4-1. Tristin Smith got the Mountain Lions on the board first, singling home a run in the bottom of the second, but UNG answered in the very next frame on a Chase Sudduth single to tie the game up at 1-1. Later in the inning, Nick Clarno hit a double with the bases loaded, plating two Nighthawks to push the score up to a 3-1 lead. Sudduth gave UNG an insurance run in the fifth inning on a solo blast to straight away center to push the game to its final score. YHC loaded the bases up in the bottom of the ninth, but Parker Morrison slammed the door shut with a strikeout to end the game. Bower (6-2) gave up just the one run on nine hits while striking out eight Mountain Lions. He did not issue a walk. Sudduth was the lone Nighthawk with multiple hits, smacking three of UNG’s five hits on the day. North Georgia drew eight walks in the game. The two teams will meet up again tomorrow at Zell B. Miller Field with first pitch set for 3 p.m.
DAHLONEGA – A Conner Corbitt home run sent the No. 9 University of North Georgia baseball team on a comfortable track to close out Southern Wesleyan with a final score of 8-4 Wednesday evening at Bob Stein Stadium. After an early Warrior home run in the top of the first, the Nighthawks quickly pulled away as Crews Taylor, Conner Corbitt and Nik Levensteins all hit bombs to give UNG a 7-2 lead through three innings complete. After the fifth inning, things started to slow down, but not without one final Nighthawk run as a Bill LeRoy hit put Taylor home to stretch the lead to 8-3 before SWU found one more run in the ninth. Corbitt led the Nighthawks at the plate with two homers, going 2-for-3 with four RBI and two runs scored. William Mapes and Chase Sudduth each had three hits in the game. Austyn Wright (2-0) earned the win, going three innings while giving up just one hit in his time on the mound. The Nighthawks will host Francis Marion this weekend and will start with a Friday night matchup at 6 p.m. at Bob Stein Stadium. GREENWOOD, S.C. – Logan Archer shot a final-round score of 70 to finish in a tie for fifth place at the Lander Bearcat Invitational as the University of North Georgia men’s golf team finished in a tie for 10th place in the field. Archer ended in a six-way tie for fifth place, six strokes off the pace of Lincoln Memorial’s Dan Bradbury. Archer finished with a score of two-under 214 for the tournament. The Nighthawks shot a three-round total of 886 and finished in a tie with Flagler. No. 11 Lincoln Memorial finished on top of the leaderboard, followed by No. 32 Clayton State. Lander ended the tournament in third place, followed by No. 36 Georgia Southwestern and No. 37 Newberry, who finished in a tie for fourth. North Georgia finished a stroke ahead of No. 41 Wingate on the leaderboard. The Nighthawks will be back in action at the LMU Tennessee River Rumble next week.